My life has gotten the best of me once again. I'm living at a pace too fast to write it all down. The opening and closing of the MGLFF has pasted. I've been to films, plays, and the beach, not to mention my new addiction for the gym, all without a word describing my experiences. I even visited what I thought was going to be Knott's Berry Farm (even though it's in Buena Vista, California) but turned out to be Knaus Berry Farm, a small farmer's market tourist stop in the middle of nowhere famous for its fruits, vegtables, and sticky buns. It was somewhere to go on a lazy Sunday afternoon. We did make a stop at Cauley Square, a village of bungalows now housing boutiques, shops, galleries, and a tea shop. 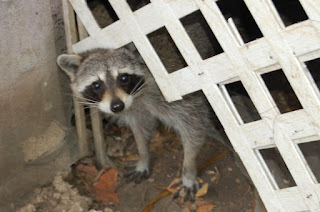 One of the shops was the home of a pack of racoons (about forty or so) who lived underneath the house. Today I woke up and realized that I had once again neglected my blog. My excuse can be found at http://www.miamiartzine.com/. Content and photos are all my responsibility to upload and I'm busy every day. There's always something new to put up on the site, a new review, a new editor's pick, a new gallery, or blog. Check it out. This should be an exciting week as I'm researching my Adrenaline Adventures feature for Where Magaine. I'll be swimming with the dolphins, parasailing, waverunning, and floating weightless. In case you're interested, here's one of the racoons.